Looking for something fun to do during the school holidays? 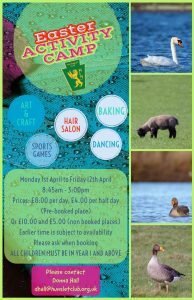 Our Activity Camp is the place to be! Football, dance, cooking, arts & crafts, dodgeball, cricket, table tennis, gaming, pool, rounders, rugby and much much more! Please note you may be asked to provide proof of age for your child in the form of a birth certificate. Children must register as members of The Hunslet Club via a Membership Form. This is free of charge. The Club accepts cash payments only. We do not have facilities to take card payments. Refunds will not be given and days are not transferrable once booked. Our Summer Activity camp was our biggest to date attended by an average of over 100 children and young people each day. How was the activity camp helpful to you? How confident were you sending your child/children to activity camp? Knowing there is great staff working with the kids. How confident were you after the activity camp had ended? Really confident as my children were very happy and had a great time! Did your child enjoy the sessions? What part did your child/children enjoy the most? Did your child/children face any problems whilst here? How useful did you find the activity camp and staff? Staff were friendly, useful ,friendly and polite. The environment makes you feel safe, fun and friendly. What did you/your children like the least? Would you send your child/children again?